My African milk tree has been growing and doing really well. However, lately I've noticed it is getting purple at the ends, just on the inside (and I think it is feeling a little soft as well, unless maybe it's supposed to...). Any idea what the issue is? I know it is time to repot to a bigger pot, but not sure if that is the issue, or something else. Thank you! Soft tips in any plant isn't good, and the color changing like that is a bit alarming too. The cause could be that the plant got a bit too cold at some point, maybe a while ago, and the damage is just showing up now. It's only when the plant is prepping for a growth spurt that this shows. As the native habitat of these plants is near the equator, where it never gets cold, this could definitely affect the plant like that. I would do some judicious pruning to get rid of them and prevent any rot from spreading - before it gets to be a problem. I might wait a bit until the cuts are calloused to repot it, no point in stressing it out too much! As you may already know, the sap in these plants (Euphorbia trigona) is caustic, so please use caution (and gloves, eye protection, and other safety precautions) when cutting them. Thanks Jacki. I just took another look at it again, and some are soft while others are not. The softness might also be the new growth that has been happening through the winter (for some reason, maybe b/c of the heating, my cactuses actually grow more in the winter). If the softness is normal, could there be another reason for the purple ends? There is the possibility that the plant needs more phosphorus, lack of it can cause a color change in other plants. I would maybe give it a tiny amount of water soluble fertilizer with balanced nutrients (three numbers the same) or some compost tea. Keep a close eye on it after you do this, and let me know what happens! Thanks so much, will try the tea. I did cut off a few of the branch ends, and had cloth gardening gloves on, and glasses. I didn't realize how sticky the sap is and how fast it dries. Some of it actually dried on the scissors. I tried rubbing it off while wearing yellow thick plastic gloves, and then just using paper towel. I didn't want to use a scrub, b/c then the sap would get on it and I'd have to discard it. I am assuming there is some sap on the gloves now as well, even though I washed them with soap. Is this dangerous? Should I discard the gloves? The scissors? 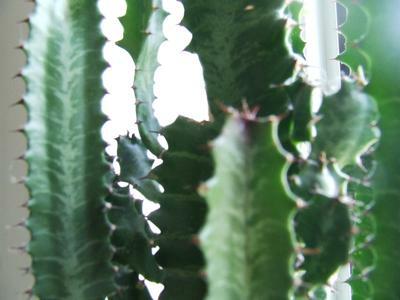 I've done some reading regarding this plant, as well as euphorbia tirucalli. Apparently the sap of the latter can be quite dangerous; is the african milk tree the same, or a bit more forgiving? Which items do I discard? thank you! p.s. as I was cutting, I also noticed a few open pores and some substance coming out. Not the milky sap, but something transparent, and at one place there was a little bubble coming out. Not sure what's going on with this plant...? 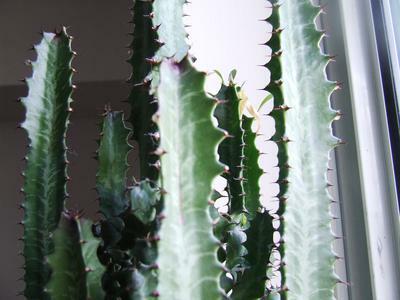 The sap of every member of the Euphorbia genus is poisonous, and it's not worth taking a risk. I would chuck the gloves and anything else porous. The scissors may be okay if you can get the sap off. I'm not sure what the 'bubbles' are that you refer to. I have never grown these plants - too paranoid! Maybe someone else can chime in if they're familiar with them.